It may not surprise you to discover that the five best live casinos in the USA are all located in Las Vegas. 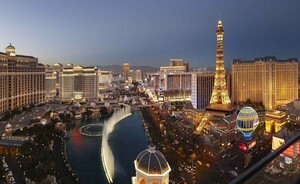 That right, the city that established the hallmark for casinos worldwide has the best of the best. What makes a casino great? It can be a combination of many different things, including its customer service, gaming opportunities, atmosphere, and/or creativity. Some casinos are fantastic for those who want the ultimate big and brassy Vegas experience, while others are the right fit for those who desire the feel of a relaxing resort and spa. Here’s a look at five of the best in the US. Each is different from the others, but every one of these casinos offers visitors something special. All five have managed to separate themselves from the more than 70 established gambling parlors in Vegas and the hundreds more located throughout the USA. The Aria is an astounding casino in many ways. With over 150,000 square feet of gambling space, it has everything any player could want. There are 145 table games, including craps, roulette, baccarat, and blackjack. You’ll also find Let it Ride, Pai Gow and Ultimate Texas Hold'em, as well as many other games. The Aria offers 1,940 slot machines and a plush poker room with 24 tables. 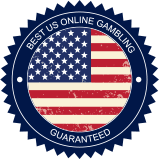 You’ll find cash games as well as daily tournaments. For high rollers, there’s The Ivey Room. The Ivey Room contains one table and it’s a high stakes one so you better be a shark with cash if you’re going to play there. Plus, the Aria features a small but nicely appointed sports and race book. There’s plenty of action on the two 220-inch TVs and over 200 live events on which to bet at any given time. This Vegas casino is sleek, polished, and luxurious. The expansive gaming room provides players with plenty of gambling choices, and those with diverse betting interests can enjoy sports, racing, and poker. There is something exceedingly different about the Red Rock. It’s true that it’s big, and there are plenty of gaming choices with 3,000 slot and video poker machines just waiting to be played. 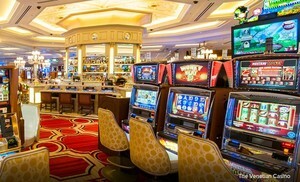 Plus, there are 60 table games, including favorites such as craps, roulette, blackjack, and baccarat. But there’s more. 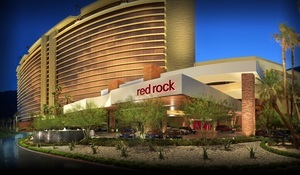 The Red Rock facility includes a 600-seat bingo parlor with smoking and non-smoking sections and a 20-seat keno lounger. The poker room is open 24 hours and its 20 tables are smoke free. There’s also a private poker room that’s reserved for high stakes cash games. Add to that a 200-plus seat sportsbook that includes a towering 96-foot video wall, and you’ve got a casino devoted to offering the ultimate gambling experience. You’ll find no end to the sports betting opportunities at this first-class Las Vegas casino. Along with all of the action that the Red Rock has to offer, there’s the manner in which it has emulated and connected with the natural beauty of the Red Rock Mountains. This is a truly beautiful casino that is also a world-class resort and spa. You won’t want to leave. The name MGM Grand is synonymous with gambling and big events. It is a classic Las Vegas casino in every way with over 170,000 square feet of space for players. This is a huge and luxurious gaming facility that includes more than 2,700 slots and video poker machines. You’ll also have access to plenty of table games offering a variety of minimum and maximum bets. Gamblers can enjoy classic games such as roulette, blackjack, and baccarat, and some of the newer favorites, including Casino War, Three Card Poker, and Let It Ride. They also provide innovative and exciting new table games, such as Crazy “4” Poker and Texas Hold’em Bonus. The smoke-free, 23-table poker room features ongoing cash games. This is a wonderful retreat for the poker player interested in solid action. Take a break from the casino games and enjoy your favorite poker variant. The MGM sports and race book is renowned for its luxury and betting opportunities. Featuring four premium skyboxes and a lounge with over 100 seats, there’s no end to the action. Included for your viewing pleasure are thirty-six 65-inch LCDs and twenty-four 42-inch plasma televisions. You’ll enjoy more than 50 channels of simultaneous race and sports betting action. The MGM is considered to be the ultimate in the classic Las Vegas gambling experience. The action is non-stop and the amenities and features are topnotch. Customer service is renowned at this hallmark Las Vegas casino that features a design motif that will instantly transport you to the grace and beauty that defines Venice. The gaming environments in this casino, which is famed for its architecture, are unique and innovative. The Venetian, along with its adjacent site The Palazzo, includes over 230 table games and more than 2,400 slots. Along with standard table games such as baccarat, roulette, craps, and blackjack, the casino features various new games such as Fortune Asian Poker Progressive, Sic Bo, and Spanish 21. The new Sands Poker Room offers players a comfortable, relaxing smoke-free environment where they can enjoy their favorite card game. There are close to 60 tables and included are cash games, daily tournaments, and DeepStack Extravaganza tournaments. At 14,000 square feet, this is the biggest poker room in Vegas. The Venetian race and sports book, which is open 24 hours a day, is powered CG Technology™ and offers players a magnificent 10 x 100-foot video screen. Experience 42 separate sporting events at once on this hi-tech screen. Included in the facility are 118 personal betting stations. If you’re a premium guest, you can enjoy a whole new level of gaming experience on the 50th floor of The Palazzo and 36th floor of the Venetian. These are exclusive areas that provide additional benefits and feature unique offerings. Poolside gaming is on-hand at The Palazzo and blackjack and craps may be played inside Lagasse's Stadium, a premium sports bar that is the primary location in Vegas for viewing big sporting events. The Cosmopolitan of Las Vegas is one of the newer casinos in town. Offering visitors friendly dealers, an upscale atmosphere, and ultra modern facilities, it has quickly become a favorite amongst Vegas visitors. Players get an expansive view of the Vegas Strip through The Cosmopolitan’s magnificent floor to ceiling glass walls. If you love playing table games, then you’re bound to find the right one at the right price at this casino. With over 100,000 square feet of gaming space, there are 83 casino tables available. Games include craps, roulette, and blackjack, as well as mini-baccarat, Casino War, Ultimate Texas Hold’em, and Fortune Pai Gow Poker. For those who enjoy games that feature spinning reels, there are close to 1,500 slot and video poker machines. You can play some machines for as little as a penny and others for as much as $500 a spin. The Cosmopolitan of Las Vegas Race & Sports Book is powered by CG Technology™ and offers sports bettors a dynamic experience. 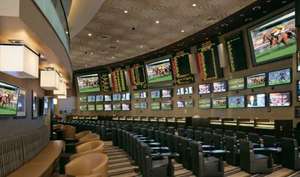 The book includes 42 stations for betting, plenty of hi-tech viewing screens, and lots of action. The room, which is designed with a sleek, contemporary flair, is a great place to see the sports on which you’re betting. If you’re looking for a new look and winning customer service, as well as plenty of wagering opportunities, The Cosmopolitan of Las Vegas is a casino that you must visit. Be prepared to be entertained on every level. There are 65 or more casinos in Las Vegas from which to choose, and many more located in Atlantic City, California, New England, and many other parts of the US. Still, the finest gambling experience you’ll find is in Las Vegas, and it’s at these five casinos.